Get out this weekend and get a copy of horror movie Get Out. “The video and audio presentations are both excellent and the extras are all worth listening to and watching, although there could be more in that department,” High-Def Digest said. “Universal’s Blu-ray handles everything quite well with strong image detail, texture, and black levels that feel deep without swallowing up everything else,” DVD Talk said. “It’s a lovely looking piece which, despite the limited settings, makes the most of the gorgeous exteriors and claustrophobic interiors,” AVForums said. 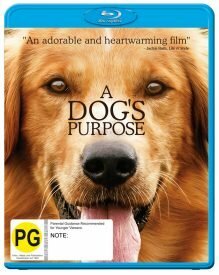 “A Dog’s Purpose supports some beautiful and bright canine photography, and the 1080p transfer brings that to life in impressive clarity,” DVD talk said. “Sharpness is outstanding in capturing the facial expressions of all of the adorable dogs who play Bailey and his other incarnations during the film,” Home Theater Forum said. Digimon Adventure Tri. Part 1 – Reunion.